Wrightia Tinctoria is a small and beautiful deciduous tree that grows up to 10 meters. Its leaves are opposite, up to 8-15 cm long and lanceolate. Bark ivory colored. 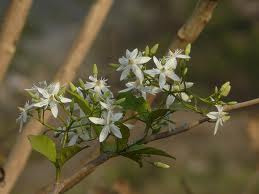 Flowers are usually seen in the tip of branches, scattered in the inflorescence and whitish and with fragrance. Fruits are long follicles with adhered tips and long up to 50 cm. Seeds are 1-2 cm long. It has a light gray, scaly smooth bark. Native to India and Burma, Wrightia is named after a Scottish physician and botanist William Wright (1740 - 1827). From a distance, the white flowers may appear like snow flakes on a tree. The fruits pendulous, long paired follicles joined at their tips. The hairy seeds are released as the fruit dehisces. The leaves of this tree yield a blue dye called Pala Indigo. English :Sweet Indrajao, Ivory wood, Pala indigo plant. Plant pacify vitiated tridoshas, fever, stomach ache, skin diseases especially psoriasis and non-specific dermatitis. It has anti-inflammatory and anti-dandruff properties and hence is used in hair oil preparations. Clinical trials of 90 days duration using ointment prepared from wrightia tinctoria oil have shown encouraging results.There is a marked reduction in the severity of the disease (90%) and definite clinical improvement, i.e. Disappearance of lesions, reduction in surface area of skin involved and reduction scaling. The clinical response is also supported by histopathological evidence.No side effects or any untoward reaction of the drug are seen during treatment. Read more about Ayurvedic Management of psoriasis.